With mobile device use ubiquitous at this point, federal agencies are still finding out how to improve customer experience on their platforms for the public and contractors. At least one agency found that a successful transition to mobile connectivity can be long and difficult if legacy systems clog the process. But the lesson learned by those ready to make an entire culture change is that the results can be startling. Such was the dilemma faced by the Department of Education’s student aid program. “Maybe in typical government fashion we were a little slow to embrace mobile,” said Chris Greene, chief customer experience officer for Federal Student Aid (FSA). “For years, we’ve known people used mobile devices to interact with us, but up until now we didn’t really optimize any of our products or services to a mobile engagement,” Greene told Federal Drive with Tom Temin. In a world where businesses see 50 percent or more of their traffic coming from a mobile device, not having mobile-optimized products and services makes for a poor customer experience. In practical terms, that means FSA has begun designing mobile products and services that ensure customers can get what they’re looking for on their phones. The first product to answer that call is FSA’s new mobile app, myStudentAid. For decades, students and their parents have faced a gauntlet of policies and forms when applying for the more than $120 billion in federal grants, loans and work-study jobs available. FSA is hoping this new app will be part of the antidote for those who previously gave up on the process. By failing to finish the forms, an estimated $2 billion in free college aid was left on the table last year. Early returns point to a huge success. “The app has been live now for about 2½ weeks and so far we have about 1.5 million applications for student aid, which is pretty amazing,” Greene said. 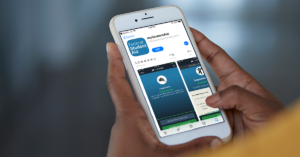 The myStudentAid app not only makes available the Free Application for Federal Student Aid (FAFSA), the document that starts the process, but it provides a range of different features. It includes resources available to help them go to school and information on how to apply for aid. Then it will help you manage your funds when you get into school and ultimately, it will help manage any student loans after graduation. FSA sees the myStudentAid app as a resource that students and parents can literally have in their pocket and use it at their convenience.